I love verses 23 – 25. God reassured Paul that he won’t die and the people with him on the boat. God is not a man that He should lie, if He has said it, then He surely will do it (Num 23:19). Paul was so confident that God is able to do what He has said He would do. He didn’t doubt at all. Infact he was very calm in the midst of the storm. He maintained his peace to the point that he was asking the crew to eat and stop worrying. He knew God can’t fail or go back on His word. That gave him the boldness and confidence he needed to endure the storm. Friends, pls don’t let the circumstance you are in now rob you of your peace. Hold onto God’s word about the situation and let it encourage you to keep going. Philippians 4: 6- 7 tells us to not be anxious about anything…and the peace of God, which transcends all understanding,will guard your hearts and your minds in Christ Jesus. I believe Paul was living out this verse in this chapter. I am so encouraged by chapter 27 and 28. I’m excited that God keeps His word. If we do our part, we can be rest assured that God will definitely do His part. What has God promised you? Friends hold onto it, even if it feels highly impossible to you. With man it might be impossible, but with God all things are possible (Luke 1:37). 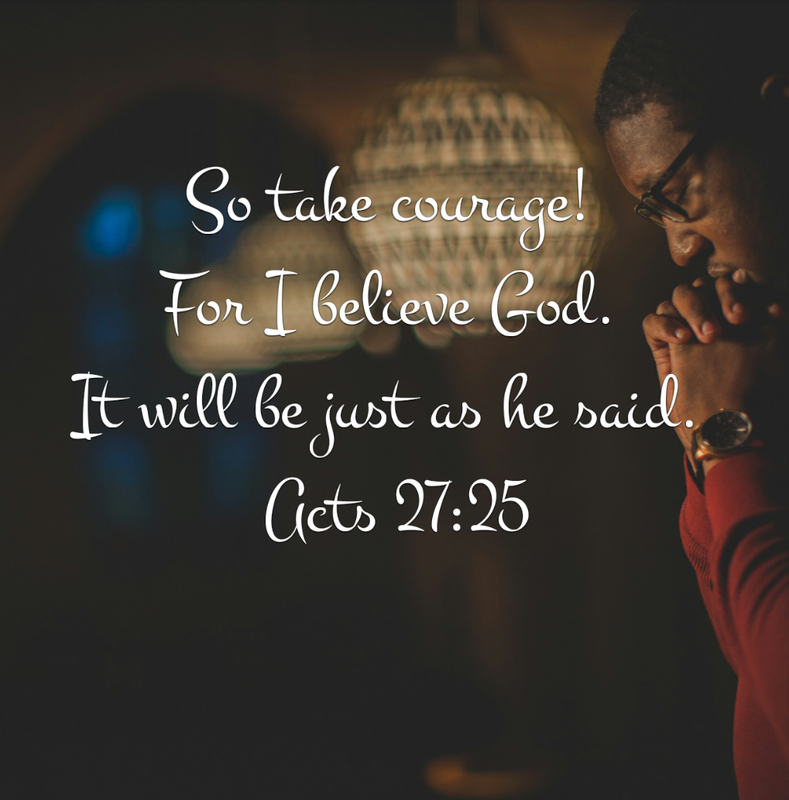 Acts 26 – Fighting against God? Good evening y’all. Today we are studying Acts 26. The latter part of verse 14 caught my attention. 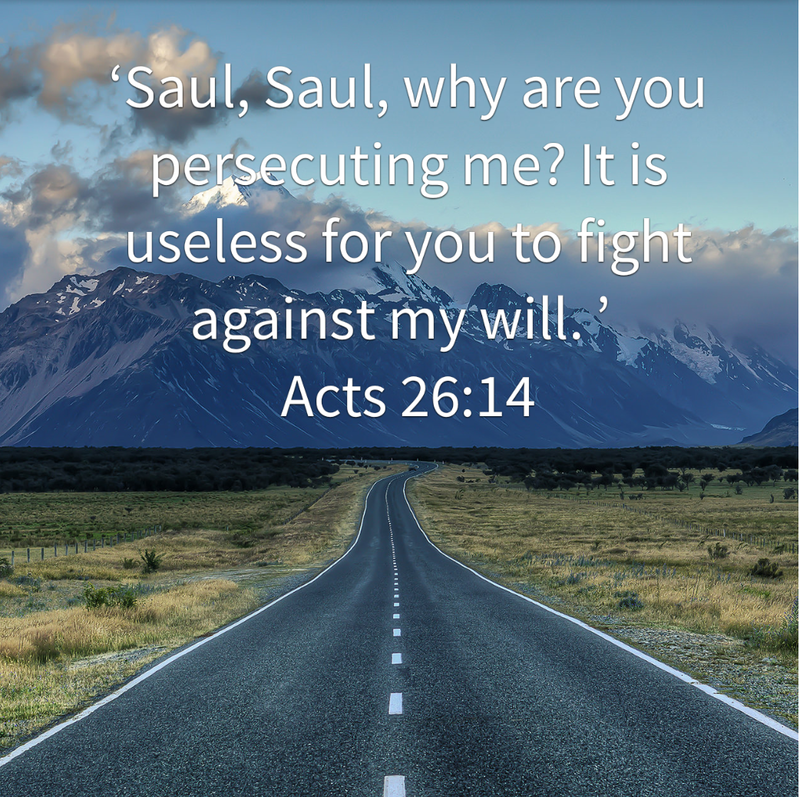 “We all fell down, and I heard a voice saying to me in Aramaic, ‘Saul, Saul, why are you persecuting me? It is useless for you to fight against my will”. It’s absolutely impossible to fight against God. He is the omnipotent, Omnipresent, omniscient God. The one who knows everything and sees everything; there is absolutely nowhere you can hide or run from God. The Psalmist said it very well in Psalm139. “For I know the plans I have for you,” says the Lord . “They are plans for good and not for disaster, to give you a future and a hope”. Let this encourage you today to surrender and let God have Hs way. I will end with Matthew11:28 in the message version.